You could garden for decades without knowing a word of botanical Latin, but understanding the nomenclature of plants gives you insight into plant behavior and just plain makes you feel smarter. The naming rules now used for plants were developed in the 1750s, thanks to Swedish scientist Carl Linnaeus. Frustrated by the confusion inherent in common names (a bluebell in Moscow, Idaho, is not a bluebell in Moscow, Russia), Linnaeus developed a system by which plants could have uniform names whether you were in Italy or India. Since Latin was the language of science at the time, Linnaeus used Latin. His system categorizes each plant by genus and species. (Also by family, kingdom and other higher order issues, but for most gardeners it is the genus and species that matter.) It was a gargantuan task and it’s amazing, really, that his system has stood the test of time so well, though plant taxonomists continue to adjust and change the names, sometimes to the frustration of gardeners, who just want to know what a plant is called. Genus names for plants originated with a variety of sources, according to Bird’s lovely little book on botanical Latin. Some were descriptive, others old names, some names Linnaeus just made up. The species names are typically descriptive, often telling you what the plant looks like or its growth habit, and these are most useful to gardeners as they select plants. If a plant is called Hosta alba, for example, you would know it was white in some way. Plants with words like marginata in their names are edged; those with mucosus are slimy, those with solaris probably need to be planted in a sunny place, and on and on through hundreds of species names. Other names are just fun to know. For instance, the very popular Clematis jackmannii is named for its breeder, George Jackman of Woking, England. 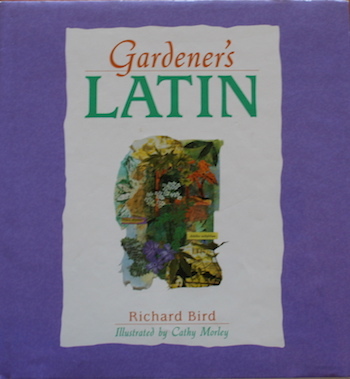 Gardener’s Latin seems designed for browsing rather than studying, and that’s fine. Botanical Latin is a subject best absorbed slowly, with your curiosity as your guide. With its clear, spare text and sweet illustrations, Gardener’s Latin provides a perfect introduction to the language of plants. Tomorrow: Birdscaping in the Midwest.